There’s nothing like having to move house a few times to make you rethink your furniture. That dining table you love isn’t looking so good when it requires four removalists to budge it, let alone getting it out the front door. Designer Clark Davis has had his fair share of house moves, many of which involved just him and his tiny car. He needed furniture that could be flat-packed – not just the Ikea definition of flat-packed, but pieces that could be assembled and disassembled over and over again. Gypsy Modular was born. The furniture is designed to have the same functionality as Lego, one of Davis’s favourite things when he was growing up. Gypsy assembles with no tools or hardware and components are interchangeable, so that you can mix, match and reconfigure to create new colour and style combinations and even new pieces of furniture with your set. If you have any doubts about how easy this furniture is to put together, check out the film clip below. 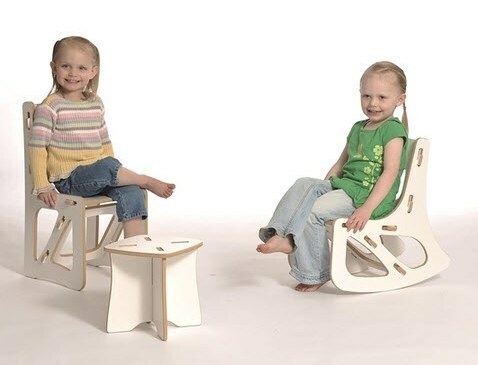 The pieces range in price from US$25 for the children’s stool to US$350 for the desk. Gypsy Modular is being launched under the innovative Kickstarter program (you pledge to buy and if there is enough interest, the project goes into production). Although only available to US residents, it will be interesting to see if Gypsy Modular gets off the ground before the Kickstarter trial ends on June 4.